Lets be honest, when you were an 11-year-old kid the last thing you thought about was anyone else, especially at Christmas time. You wanted to be bombarded with gifts, not spend all your hard-earned pocket money on loved ones, sadly. But this little guy put our younger selves to shame as it all got rather emotional when it turned out he spent all his birthday money on his dad’s Christmas present, The Mirror reports. 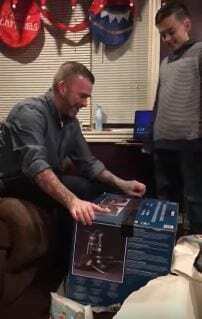 In the short clip, his father Mike is handed a massive wrapped up gift. As he tears into it he thinks it’s a new saucepan – but within the box is yet another box with the real present inside. “That’s a freaking lot of duct tape!” the dad exclaims before getting stuck into his unwrapping. It turns out his son had splashed all his birthday cash on a PS4 games console. “Mike, just so you know, he saved up all his money to buy you this, every single penny. That’s why he asked for money for his birthday, so he could buy you this,” a voice in the background says. 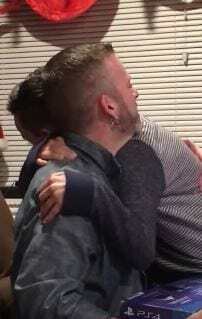 Mike says: “You made me cry,” before giving his boy a well deserved hug.